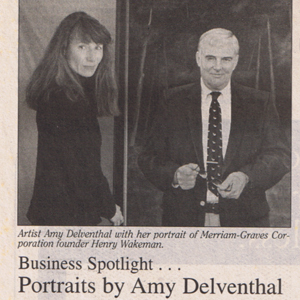 BETHLEHEM – Amy Delventhal of Bethlehem, an award-winning artist, has completed her portrait of Henry Wakeman, founder of the Merriam-Graves Corporation. Kit Wakeman, Executive Vice President of Merriam-Graves, plans to unveil the portrait at the company’s April management meeting in Charlestown. Other commissioned works to her credit include Homer St. Francis, late chief of the Sokoki band of the Abenaki in northwestern Vermont, and several members of the Clark family, founders of Clark’s Trading Post in North Woodstock. Ms. Delventhal has been invited to submit her portfolio for consideration to the Governor’s Portrait Commission and expressed excitement that her name was forwarded. Between commissioned portraits, Ms. Delventhal works most often in watercolor. Drawn to this often difficult medium by its low toxicity, she finds that it offers unparalleled opportunities for spontaneity. Her favorite genre is still life, as she enjoys the effects of light, color, texture, form, and mood to tell a story, express a feeling or evoke a memory to intimately engage the viewer.